Oven Roasted Corn - throw the corn in the oven with the husks on and bake - the result is THE BEST corn on the cob ever! We will never make corn any other way! 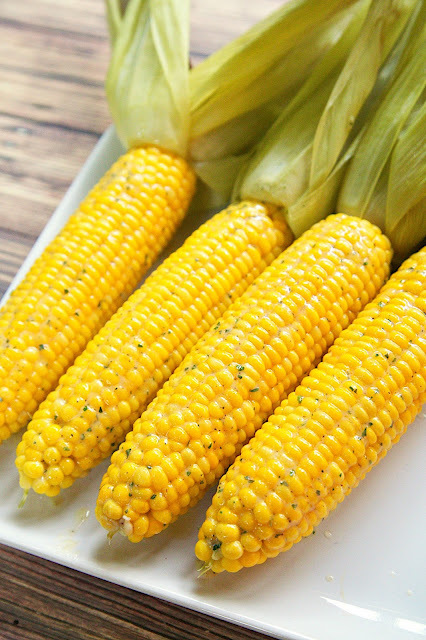 We are totally addicted to this Oven Roasted Corn. I've read about cooking corn on the cob with the husk on in the past. The recipes said it was so great and the silk just pulls right off. Well, I finally put the recipes to the test. Let me tell you, this is SO easy and SOOO good. Just throw the corn in the oven, bake and eat! We pulled the husk back and used it as our handle to eat the corn. The silk literally pulls off. No more pulling all those little strands out of the kernels. We have been eating fresh corn every week for a month. We both just can't get enough of it! 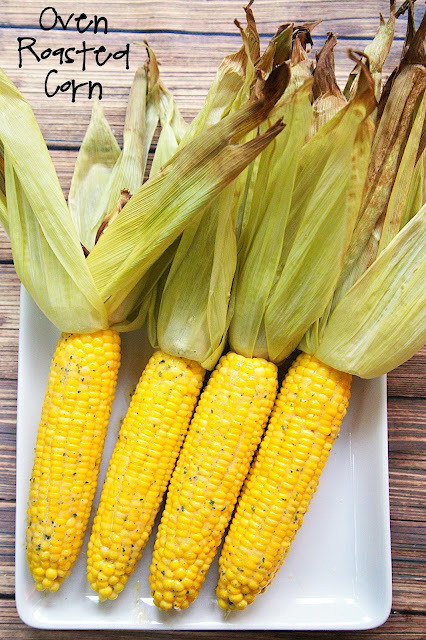 I promise if you try this recipe, you will never make corn on the cob another way again!! Preheat oven to 425 degrees. Place corn on the cob, in husk, directly on baking rack. Bake for 20 minutes. Remove corn from oven. Peel down husk and use as handle. Pull off silk. I've heard and tried roasting corn this way on the grill, but haven't tried it in the oven yet. I'll have to give it a go. Or throw it in your microwave for 3 or 4 minutes, cut inch off wide end, hold handful of hair and shake the cob out of the husk. No hair on the corn. We just found some non GMO corn from a local farmer. I have not had my precious corn in three years for GMO corn made both Hubby and me VERY sick! Since there are just two of us, it did not matter we just pig out......I buy 18 ears three times a week. Can't wait to try this easy recipe today(got 18 ears yesterday). Will let you know. Thanks! Have you tried it grilled in the husk? That's pretty much the only way we eat it now. Soak it in water for a while and then grill in husk. It takes a while and it might be hard to tell when it is done. But it is delish even when the kernels are somewhat "blackened".